Ögedei Khan, born Ögedei (also Ogodei; Mongolian: ᠦᠭᠦᠳᠡᠢ; Chinese: 窩闊台: 7 November 1186 – 11 December 1241), was the third son of Genghis Khan and second Great Khan of the Mongol Empire, succeeding his father. He continued the expansion of the empire that his father had begun, and was a world figure when the Mongol Empire reached its farthest extent west and south during the Mongol invasions of Europe and East Asia. Like all of Genghis' primary sons, he participated extensively in conquests in China, Iran, and Central Asia. Ögedei was the third son of Genghis Khan and Börte Ujin. He participated in the turbulent events of his father's rise. When he was 17 years old, Genghis Khan experienced the disastrous defeat of Khalakhaljid Sands against the army of Jamukha. Ögedei was heavily wounded and lost on the battlefield. His father's adopted brother and companion Borokhula rescued him. Although already married, in 1204 his father gave him Töregene, the wife of a defeated Merkit chief. The addition of such a wife was not uncommon in steppe culture. The Empress Yisui insisted that Genghis Khan designate an heir before the invasion of Khwarezmid Empire in 1219. After the terrible brawl between Jochi and Chagatai, they agreed that Ögedei was to be chosen as heir. Genghis confirmed their decision. 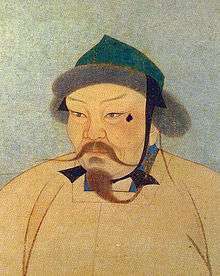 Genghis Khan saw Ögedei as a courteous and generous character. His charisma is partially credited for his success in keeping the Empire on his father's path. Thanks mostly to the organization left behind by Genghis Khan, and to the personal charisma of Ögedei, the affairs of the Mongol Empire remained for the most part stable during his reign. Ögedei was an extremely pragmatic man, though he made some mistakes during his reign. He had no delusions that he was his father's equal as a military commander or organizer and used the abilities of those he found most capable. In 1224, a Mongol envoy was killed in obscure circumstances and Korea stopped paying tribute. Ögedei dispatched Saritai (Sartaq) to subdue Korea and avenge the dead envoy in 1231. Thus, Mongol armies began to invade Korea in order to subdue the kingdom. The Goryeo King temporarily submitted and agreed to accept Mongol overseers. When they withdrew for the summer, however, Choe U moved the capital from Kaesong to Ganghwa Island. Saritai was hit with a stray arrow and died as he campaigned against them. Ögedei announced plans for the conquest of the Koreans, the Southern Song, the Kipchaks and their European allies, all of whom killed Mongol envoys at the kurultai in Mongolia in 1234. Ögedei appointed Danqu commander of the Mongol army and made Bog Wong, a defected Korean general, governor of 40 cities with their subjects. When the court of Goryeo sued for peace in 1238, Ögedei demanded that the king of Goryeo appear before him in person. 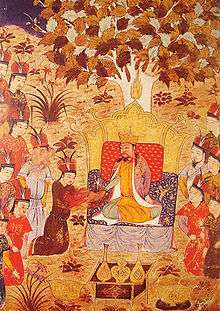 The Goryeo king finally sent his relative Yeong Nong-gun Sung with ten noble boys to Mongolia as hostages, temporarily ending the war in 1241. 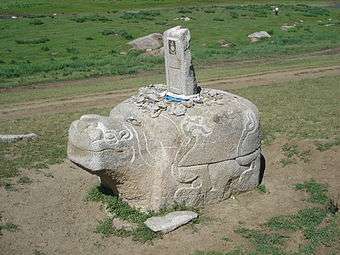 It is said that Ögedei recruited his kheshig from Koreans. After the conquest of Volga-Bulgaria, Alania, and the Rus' principalities, Ögedei's son Güyük and Chagatai's grandson Büri ridiculed Batu, and the Mongol camp suffered dissention. The Khagan harshly criticized Güyük: "You broke the spirit of every man in your army...Do you think that the Russians surrendered because of how mean you were to your own men?". He then sent Güyük back to continue the conquest of Europe. 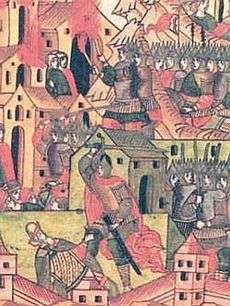 Güyük and another of Ögedei's sons, Kadan, attacked Transylvania and Poland, respectively. Ögedei Khan had granted permission to invade the remainder of Europe, all the way to the "Great Sea", the Atlantic Ocean, but his death prevented the invasions from continuing west. In a series of razzias from 1235 to 1245, the Mongols commanded by Ögedei's sons penetrated deep into the Song Dynasty and reached Chengdu, Xiangyang and Yangtze River. But they could not succeed in completing their conquest due to climate and number of the Song troops, and Ögedei's son Khochu died in the process. In 1240, Ögedei's other son Khuden dispatched a subsidiary expedition to Tibet. The situation between the two nations worsened when the Song officers murdered Ögedei's envoys headed by Selmus. Ögedei appointed Dayir commander of Ghazni and Menggetu commander in Qonduz. In winter 1241 the Mongol force invaded the Indus valley and besieged Lahore, Pakistan. However, Dayir died storming the town, on 30 December 1241, and the Mongols butchered the town before withdrawing from the Delhi Sultanate. Ögedei had nominated his grandson Shiremun as his heir, but Güyük eventually succeeded him after the five-year regency of his widow Töregene Khatun. However, Batu, the Khan of the Golden Horde (also known as the Kipchak Khanate or the Ulus of Jochi) nominally accepted Güyük, who died on the way to confront Batu. It was not until 1255, well into the reign of Möngke Khan, that Batu felt secure enough to again prepare to invade Europe. Fortunately for the Europeans, he died before his plans could be implemented. Ögedei had many khatuns and concubines. Ögedei married first Borakchin and then Töregene. Other wives included Mukha and Jachin. ↑ He was the son of Genghis Khan by Khulan khatun of the Merkid clan.